Have you ever had a night that was so amazing you just wanted to live it over and over, again and again? That was my night at the West Coast Cheesemonger Invitational. 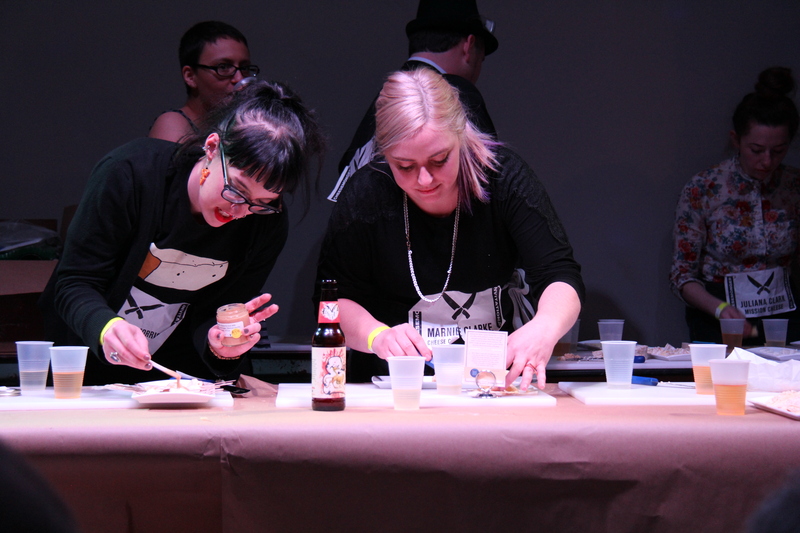 The Cheesemonger Invitational is a competition to see which cheesemonger is the best at their craft. The invitation went out to all mongers to compete and 35 mongers answered the call. Selling cheese requires more than just liking cheese and this is what this competition is all about. For those competing, the event started at 9am and, for the top ten, went until late in the evening. Their day started with a written exam followed by a blind tasting, salesmanship contest, cutting competition and finished with the creation of their perfect bite of cheese. That is when the public came in. At 5pm the doors of Public Works in the Mission District opened and allowed cheese-lovers in. I never thought I would say that it was almost difficult to eat 35 bites of cheese, each was better than the first and I always wanted to go back for more. Luckily my cheese needs were met by an amazing fondue bar and grilled cheese stand along with samplings that were available from some of the amazing cheesemakers and suppliers who attended the event. Tags: Arrowine and Cheese, Badass Brunch, Beecher's, Beer & Pizza: A Love Worth Celebrating, Bellwether Farms, Burstin' Berry Poppin' Pebbles, Calf and Kid, Cellars at Jasper Hill, cheese, cheesemongers, Chef Douglas Chiechi, Circle of Books literary salon, Cypress Grove Chevre, Dimo's Pizza, food, Foodie Friday, Greenbush Brewing, Hannah Fitzmorris, Heart-Shaped Cheesemaking, Kathe Lison, Loves Me, Loves Me Not, Marco Collins, Neal's Yard, Perry Soulos, Point Reyes Farmstead Cheese Company, Public Works, Redwood Hill Farm, Say Fromage!, Sour Sunday, Valentine's Day in Fremont's Most Romantic Dining Room, West Coast Cheesemonger Invitational.